By default, you can press the shift button to dash. Maps support the option to disable dashing when you’re on that map. However, there isn’t a solution to disable dashing manually during the game, for example during a cut-scene you want to prevent the player from dashing. With this plugin you can use a simple command to disable or enable dashing for the player. Download the plugin and place it in the “plugins” folder in your project’s “js” folder. 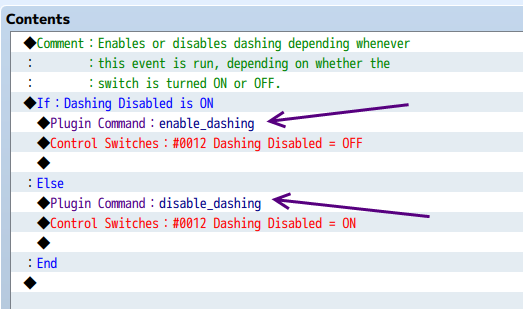 Then open your Plugin Manager (F10), double-click an empty row, and select the HIME_DisableDashing plugin.